“If you don’t realize that Facebook is taking over the interwebs — I’m here to let you know, it’s time to wake up”. I had a chat with Kristen Nice from ‘The Social Makeover’ on how to grow your personal brand with Facebook (and why it’s crucial you learn this). In this episode, we reveal brand-new Facebook updates like ‘Watch Party’ and ‘Social Learning’ (huge opportunity for early adopters here), as well as how to create an effective webinar template. 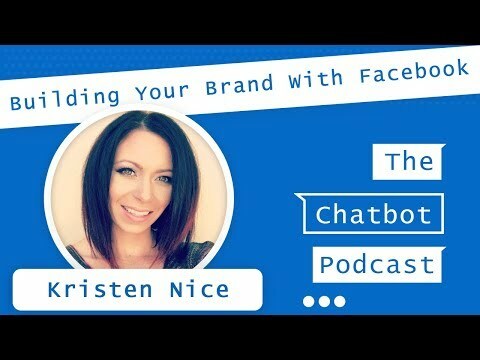 Kristen also taught me a lot about Facebook Live, Facebook groups, hashtags, emojis, and how to personalize your chatbot (or as Kristen would say, her “ladybot”). Click the play button below to give it a listen. If you want to join our free FB group, just click go over to http://facebook.com/groups/chatbotmarketing. We have also a quiz on Messenger Marketing, you might be interested in.